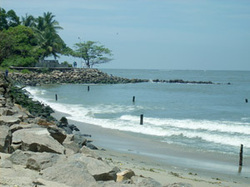 The Fort Kochi beach, with its clean premises and tranquil atmosphere, is frequented by tourists as well as the local people. There are many factors that differentiate the beach from the other beaches of Kerala. The presence of the Chinese fishing nets is probably the most easily identifiable one. The trees and the greenery on the walkway to the beach add to the serene atmosphere there. It is on these beaches that the famous Cochin Carvinal is conducted on New Year’s Eve. The sea food, the Vasco da Gama Square adjacent to the beach, a light house and a granite walkway are the other main attractions. The beach also gives you a breathtaking view of the sunset. If you are lucky, you may glimpse cargo ships passing through the sea. The remains of the Fort Immanuel can also be seen here. A section of the beach is not accessible to visitors as it is under the control of the Indian Navy.